Oxenfree is very good, big points for style. It might have made my goty list, I'd have to check. If not then it would have been number 11 in my top 10. I played through it 1.5 times, not quite making it through the second playthrough. Interesting. Thanks Bubble. Hopefully you’ll join us in the brand spanking new Adventure Game Club. The main thread is now live. We're doing this! I'm both excited and terrified. We'll kick things off with nominations. We are getting 2016: Read Only Memories on PSN next month. Anyone played it? I played it briefly and always meant to get back to it, however I learned recently that the CEO of the dev company is a bit of a garbage person. So now i'm torn between supporting the work of the non-garbage devs and just skipping it altogether. Interesting/disappointing. I remember Read Only Memories (it's 2064, btw) first coming across my radar because it was being touted for its positive work in speaking to and depicting marginalized groups. In light of that, it's surprising to hear about the issues with its founder, but I guess it should be abundantly clear at this point that, no matter how good someone is at talking about how they have good values, it is entirely possible they're still awful human beings. FWIW I played probably 2 hours of ROM several months ago and it didn't grab me. I didn't have an affirmatively bad experience with it, and generally intended to complete it at some point, but I have not felt particularly compelled to get through it. Assuming you're referring to 2064: Read Only Memories, I very briefly started it a few months back before getting sidetracked. It's high on my list of games to get back around to. Ah, good job me not hitting refresh before posting. Apologies for re-clarifying what had already been clarified. Darn, I'd heard about that but hadn't made the connection with ROM. I had closely followed a couple of the devs throughout the development process and was really looking forward to enjoying this one day with all that context. Guess it's a bit more complicated than that now. BUT WHAT ABOUT SIMON'S HOME BREW!? I've been led to believe that only Secret Files Tunguska and Lost Horizon are worth playing, but as usual, reviews on the others are mixed. Sorry, very lttp... lost horizon is not too bad. Haven’t played the second one. The secret files games are pretty bad (from the story point of view mainly, but some of the puzzles are just as awful) I got some entertainment out of them in a “wait...what’s happening now!? “ sort of a way, but ymmv. I keep coming across this screenshot and thinking I should post it somewhere so here it is. 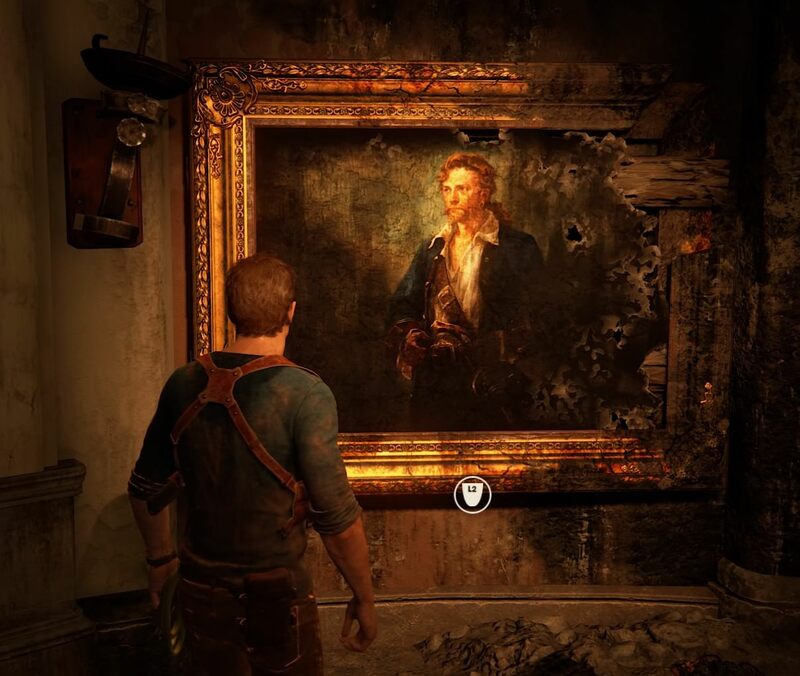 There is a puzzle room in Uncharted: A Thief's End that involves the portraits of famous pirates. Each pirate has a sigil associated with it. The painting below was missing a name tag but was connected to a monkey sigil. I don't recognise the pirate, but he sure does look mighty. A nod to Monkey Island and Guybrush Threepwood? Yup. He looks really good in that painting. I know there are a few jokes about him as well, but I don't recall any. If memory serves, he's the one pirate Sam Drake, pirate expert, can't identify. Yeah, I laughed so hard when I walked into that room and saw Guybrush. Genius! Oh my gosh that’s amazing!!!!! I played through Stick It to the Man yesterday. It's being billed as a puzzle platformer, but it's more of an adventure game than anything else. I have mixed feelings on it overall, but it has some of the most delightful cat hair mustache puzzle solutions I've seen in a long time. I've always felt like cat hair mustaches got a bit of a bad rap. I don't know if that particular puzzle was well-suited to that particular game, but I've always been fond of the bizarre, loop de loop logic of some adventure games. Maybe that's because I grew up with the genre when it was at the peak of its weirdness. I love some more serious adventure games, for sure, but tricking a hyperventilating man into inflating a taxidermied whale so that you can use it as a raft? That's my jam. The premise of the game is that your character has been infested with some kind of alien parasite that allows him to read minds. Along with that, he can pull physical copies of people's thoughts out into reality, or he can put objects from reality into their minds to plant an idea in their heads. Much of the gameplay revolves around mixing and matching people's thoughts with the environment, and it gets delightfully weird. There's a dark, slapstick humor over the whole thing that somehow works with the frankly ugly aesthetic of the artwork and environments. I don't know what kind of alchemy it took, but I like it. Unfortunately, Stick It to the Man saddles itself with entirely unnecessary platforming chase sequences that are more tedious than enjoyable, and the writing is sometimes a little questionable. There's a chapter set in a mental health institution that hits every crazy person stereotype it can, and there's a weird riff on a sexist Army general later in the game that goes in such weird directions that I don't think it has much to say about sexism so much as using it as a jumping off point for... whatever the hell that all was. Ultimately, I personally enjoyed it, but I'd be hesitant to recommend it. It's probably too platformy for adventure fans and too adventure for platform fans, but if you're in the middle of that Venn diagram and have a taste for the bizarre, keep an eye peeled for it. I enjoy weird games, adventure games and platformers! EDIT: checked out its steam page. How on EARTH is this not a Tim Schaffer game? It's like how Charade is the best Hitchcock movie that Hitchcock didn't make. I finally finished Tales from the Borderlands last night. It was good! I'd always found the Borderlands universe to be borderline repellent, Telltale's take on it was much better. I did find Handsome Jack to be a pretty tedious character, and, as with most Telltale games, there were a few things the characters did that I felt did not match my intention when I made a choice in the game. But it was a nice/sad reminder of what I liked so much about the Telltale formula. Full Throttle is free-for-keeps on GOG for the next 48 hours. If for some bizarre and unfortunate reason you have not played this game, please grab this. It is easily one of Double Fine's finest, perhaps even their double-finest. Not quite sure where this belongs, but this thread seems close enough. I played the first episode of Thief of Thieves on Xbox via Game Pass. It was really bad! I was disappointed. It being an episodic adventure-ish game based on a Robert Kirkman comic book, I had hopes that his people might know what they were doing in licensing, but apparently not. There were moments early on where it felt like there was some promise. There was a bit of style to the graphics, and there were bits of mildly interesting dialogue choices with decent writing. But things went bad when it went into more traditional gameplay. The bulk of it is sneaking around a mansion trying to steal something, as part of a story told in flashback. The poor camera controls kill the stealth mechanics. You're allowed to choose between one of two angles at any given time, usually either a close-up or a zoomed out diorama view, but often neither of them show what you need. There's this absurd system where the presence of off-screen guards is noted by a little rectangular shape. Something about their color and/or orientation is supposed to tell you whether you're in their line of sight, but I could not understand these symbols at all. There's also stuff where if you're in the dark you can't be seen...except, sometimes you can? Ugh. It's bad. Then the game starts padding. Complete the first successful attempt to sneak in to the mansion to steal a motorcycle, your character in the future is explaining how she did it. But then a character says "but that's not how you really did it, is it?" and she says "no" and now for some reason you're doing the same mission again under totally different circumstances. Why? In the harder version, you're sneaking all over the house trying to find this motorcycle during a big party. After getting caught a bunch because the mechanics are bad, I finally get where the bike is supposed to be...and it's not there. Twist! The host is actually sitting on the motorcycle in the middle of the house! And to steal it, after all this sneaking around and watching out for security, now you just walk up to the guy on his bike and press the 'steal' button, and are shown a cut scene of you knocking him off the bike and riding away. If that's the solution, what the hell was the point of all that stealth?!?! This is supposed to be episodic but i wonder if it will ever be finished. Though I guess the second episode was out on PC at release, in July but it's still not on console? I hope the folks who worked on this for Skybound have nothing at all to do with the people who are now working on the end of Walking Dead, because this was so bad! I'm really digging Unavowed. So much so that It made my GOTY list even though I haven't finished. We talk a lot about satisfying "gameplay loops" for mechanics centered games. Unavowed might be the first adventure game I can think of that has the forward momentum of a narrative focused game while retaining a sense of a satisfying gameplay loop. It feels like I'm watching a fun, prestige TV genre show and I can't get enough of it.